It seems the gang culture of NYC and Hip-Hop culture are closely interwined, at least that’s what director Shan Nicholson (Downtown Calling) discovered one day while partaking in his usual pastime – record digging. He Kept seeing a high priced record on the walls of stores from the group Ghetto Brothers and was intrigued. He vowed to get ot the bottom of why this group had such an expensive record and who they even were. His research would lead him to the making of the documentary Rubble Kings, which premiered last night at he New York International Latino Film Festival. 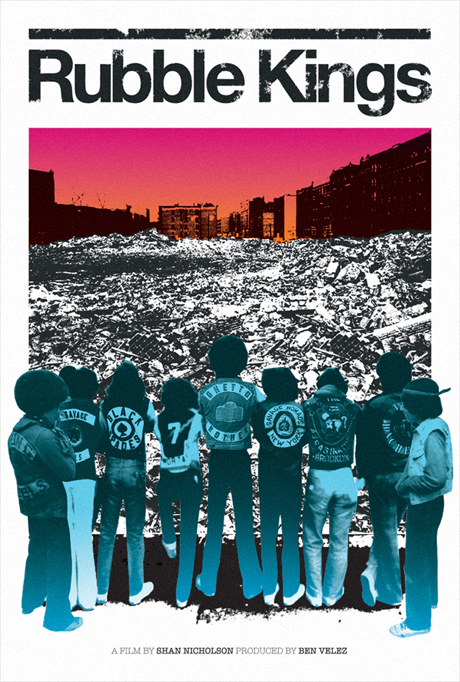 Rubble Kings chronicles the NYC gang culture from it’s inception in the 1950’s to it’s transition in the 70’s into hip-hop culture. It’s interesting to see the connection between the two. It is by far, the most in-depth look at this era in NYC history. What was interesting was how the climate of the nation played a huge part in the creation of gangs. First there were Civil Rights, and Malcolm X and Martin Luther king and people in the inner cities were mobilizing with a hint of hope. Then after all our heroes were killed, the feeling of hope died with them, leaving a group of underserved, angry people. This anger erupted into swarms of gangs, crews on every few blocks all over the city. The most notorious being in the Bronx, also known as the birthplace of Hip-Hop. Rubble Kings, a term used to describe how gangs made the members feel like they had some type of power, kings of something even if it was their own demolished neighborhood, details the rise and falls of these gangs. After much bloodshed, gangs would start to realize that the only people their rebellious, careless actions were hurting were themselves. Enter Ghetto Brothers, a group that began as a traditional street gang but evolved into a community focused movement. They formed a band and held jam sessions, encouraging youth to stop the violence and take ownership of their communities. But when one of it’s members was slain in an attempt to make peace between two rivaling gangs, that’s when everything changes. A peace treaty was formed with all groups and slowly the division softened. In the midst of this Hip-Hop would see it’s beginings in the park jams featuring Djs like Kool Herc and Afrika Bambaataa. These jams were instrumental in bringing together people from all the gangs and using that competitive attitude now for battling on the dancefloor and not in the streets. Rubble Kings combines personal commentary of gang members and stellar archived footage for an insightful and intimate look at gang culture never told before. This film struck a chord with me for many reasons. For one, I am a huge fan of Hip-Hop. And two, because it shed light on a part of my personal history that is never discussed- the role gangs played in my family. My uncles and my father were involved in gangs, Savage Nomads to be exact which are discussed in the film. I remember hearing how my grandmother sewed their patches on their jackets for them, not only accpeting it but encouraging it. Back then, it was the only way to survive and she worried about her boys. If you wanted to survive, you aligned yourself with a gang, period. But I never knew more than that. This film helped fill in the gaps of how and why this was the way of life for many Puerto Ricans in New York during that time. For that, I am grateful. I think this is a must see film for anyone who is not only a fan of Hip-Hop, but who wants to learn about an overlooked, influential era in NYC history – and how it sparked a transition that would change the world. For more info on future screenings follow Rubble Kings on Twitter.